University of Hawaii researchers partner with Schmidt Ocean Institute to map 11,000 square kilometers of the ocean floor, creating detailed images of major seamounts. HONOLULU, HAWAII – In a recent research expedition sponsored by Schmidt Ocean Institute (SOI) and led by University of Hawaii scientist Dr. John R. Smith, over 11,000 square kilometers of the ocean floor were mapped in high-resolution for the first time. Smith, working with Jonathan Tree, University of Hawaii, and Joyce Miller, used multibeam sonar on SOI’s research vessel Falkor to generate detailed maps of portions of the remote Johnston Atoll Unit (JAU) of the Pacific Remote Islands Marine National Monument (PRIMNM). (A) Big Top’s “backscatter” data layered over a 3-D model of the bathymetry. The light colored bronze colors are softer substrate like sediment and mud while the darker colored bronze reflects areas of hard rocky areas; (B) Bathymetry of the Big Top seamount with 200 meter minor and 1000 m major contours to show depth, also based on the color of the seamount where the cool colors are the deepest and the warm colors are the shallowest. The deepest parts of the seamount rise from depths of about 5500 meters below sea level to about 1200 meters below sea level; (C) The geological interpretive maps showing the boundaries between different kinds of rocks. 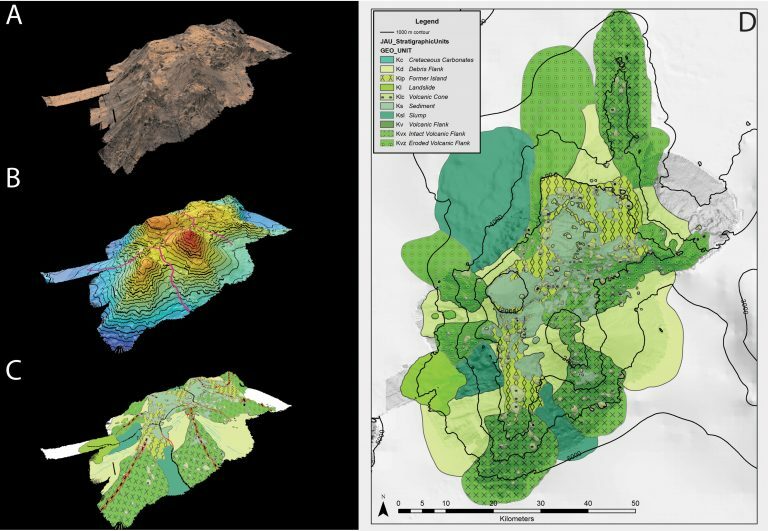 The same map is shown in; (D) which contains the key to understanding the different colors and symbols that are used to show each geological unit. The green shaded shapes show the interpreted age of these rocks in Cretaceous period (more than 65 million years old). This is a satellite view of the area being mapped, shown here inside the yellow lines. Compiling the days of multibeam mapping results revealed fascinating structures under the ocean surface. The last of these features to be mapped, and perhaps the most interesting, is a large seamount dotted with smaller peaks currently referred to as ‘Big Top’, as it resembles the broad striped big top tents commonly seen at carnivals. In addition to revealing the shape of these seamounts, the mapping that was completed on this expedition also yields valuable insight into their geologic composition. Although ‘Big Top’ is now one large mass, this analysis demonstrates that it was potentially four distinct volcanoes reaching thousands of feet above the ocean surface in the past. Since then, continued remodeling in the form of volcanic eruptions and erosion has morphed it into one large, sub-surface mountain. 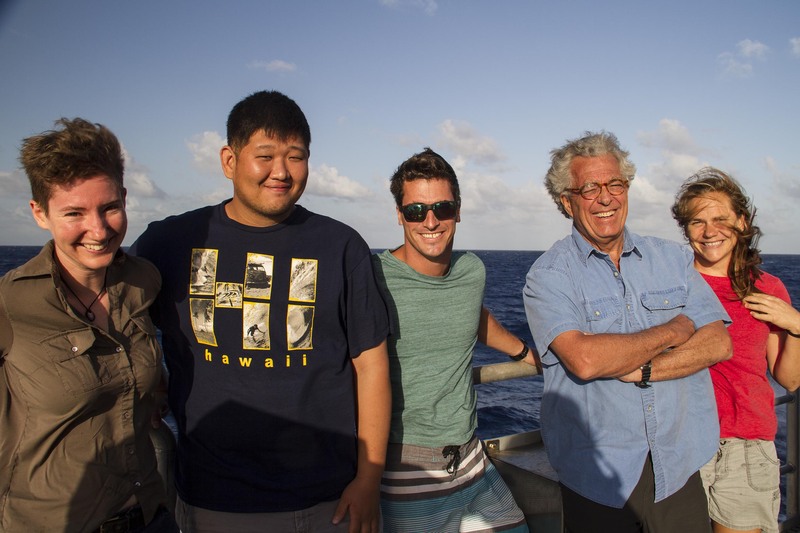 Lucy Bellwood, Andrew Kang, Brock Callen Jr. and Sr. and Jena Kline on board Falkor for the mapping research cruise around the remote Johnston Atoll. A dedicated science outreach team to engage the public in these essential mapping expeditions accompanied Smith, Tree and Miller on this three-week expedition from Guam to Honolulu. Adventure cartoonist Lucy Bellwood created a comic book series presenting the science of multibeam mapping and highlighting the unique findings of this expedition, which were also turned into a film short. Additionally educators including Jena Kline (‘Iolani School, HI) and 11th Hour Racing grantee Brock Callen Sr. (Martha’s Vineyard Regional High School & Sail Martha’s Vineyard, MA) designed curriculum for students based on the data collected at sea, and along with 11th Hour Racing Ambassador Brock Callen Jr., conducted Ship-to-Shore connections from the ship to engage classrooms in oceanographic research and conservation.